After our excellent tour of 19th Dutch and a delicious lunch in the surrounding neighborhood of southern Manhattan, the GLCM group found themselves inside the Oculus. 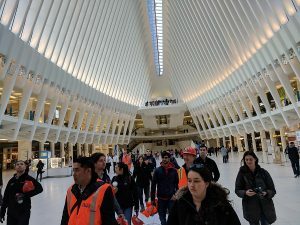 The Oculus serves as the World Trade Center’s transportation hub connecting both New Jersey and New York to Manhattan. The building itself was designed by Spanish Architect Santiago Calatrava who created the building trying to imitate a dove taking flight. The total cost came out to $3.9 billion which is $2 billion more expensive than the original estimate. 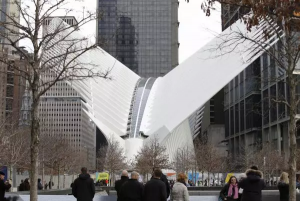 But the cost overruns seem to have been worth it since the Oculus has become a staple of New York City’s architecture. The “dome” of the Oculus is made of white structural steel weighing about 11,500 tons. 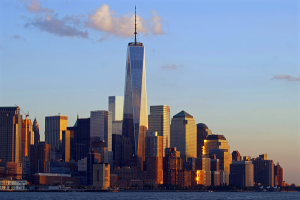 The entire structure was built by Skanska which helped recreate the entire World Trade Center Terminal. The group then walked through the Oculus to One World Trade Center and the 9/11 memorial. The Freedom Tower is New York Cities tallest Skyscraper, peaking out at 1,776ft which is a deliberate reference to the founding date of the United States of America. The building was developed in part by the Port Authority of New York and New Jersey. Tishman worked as the main contractor from 2006 to 2014. On top of being the tallest building in New York, it is also the tallest structure in the Western Hemisphere. Upon leaving the building the GLCM group were greeted to a beautiful display of the 9/11 memorial. The black stone encases the names of all 3000 victims and service members who perished during the 9/11 attacks. White roses were seen placed on some of the victims indicating that today would have been their birthday. The memorial is designed in the footing locations of the two towers. 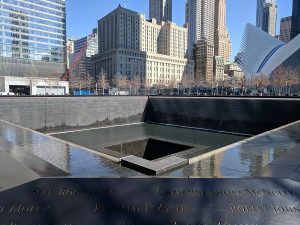 Properly called the “bathtub”, the old foundation was turned into a never-ending fountain that continuously pours water into the center of the memorial. It was beautiful sunny day during our tour and the impact of walking around the park will remain as one of the main keepsakes of this journey. 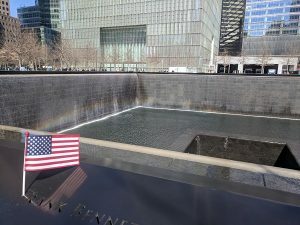 After relaxing around the memorial, the GLCM crew ventured over to One Penn Plaza where we met up with WSP Global. There, we met Alex who gave us a nice tour of the WSP New York Office. The office itself is LEED Gold and houses three floors within the building at One Penn. Their New York Office alone employees 1000 people in the six main services WSP operates. We got to see what WSP calls “the cave” which is a giant telecommunications conference room housing a full wall TV display for detail design meetings. The group then got a presentation by Brendan Smith detailing his work on the LaGuardia Airport reconstruction of Terminal B. 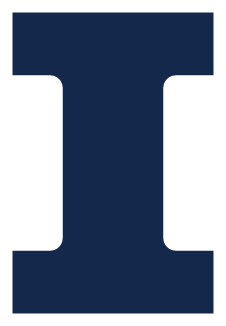 The project is a P3 project which means it is funded by a private entity for public enterprises. The project itself is meant to reduce congestion for both the air and the land. Since being built, Terminal B has been in desperate need for renovations to keep up with the constantly changing demand of modern day airports. This new design will allow planes to taxi freely without being delayed while also improving the traffic flow of pedestrian cars into the drop-off area. The main problem faced by WSP is the mitigation of settlement since the old airport was built on land-fill. Expected opening of the new terminal is to take place in 2022 with the starting of construction in terminal C and D with Delta. 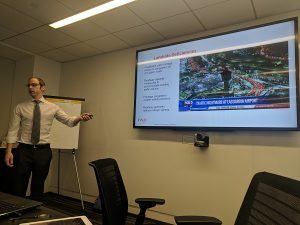 After Brendon, WSP had Rick Cardente talk to the students about his career as a Structural Engineer and his accomplishments from being born and raised in New York City. WSP’s visit was then concluded with a presentation about Developing Professional Networks, a program run by WSP to enhance the careers of up and coming employees to get them on the early path of success. This was presented by Bruna and Teresa, who gave the students great advice about fitting into the professional world after college. With all this, our day wasn’t complete yet. 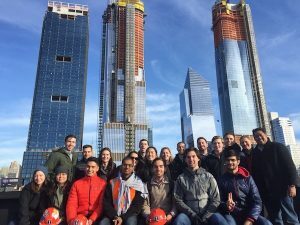 The students then headed down to their final destination of Hudson Yard; the world’s largest private real-estate development. The GLCM group explored this site by walking the high-line; a repurposed elevated train line converted into a 2-mile-long scenic pathway overlooking the city. This gave us a perfect vantage point of each newly developed skyscraper. We eventually walked the entire Highline to Chelsea Market where the Global Leaders ate dinner before returning to our hotel for the evening. The overall day was jampacked full of adventures and developmental learning. The interactions with WSP gave us a design firm’s perspective on construction. As we get ready for tomorrow’s visit to LaGuardia, we will use WSP’s design knowledge along with Walsh’s logistics to compare how a project truly comes together from start to finish. Please read tomorrow’s blog post to see the highlights from LaGuardia. Global Leaders would like to give a special shout out to WSP for allowing us to visit their office and for hosting us during our New York Trip.